The New Year is here! How are you doing on your resolutions? I always joke on day one that I’ve meet my goals “every day” this year. But by the end of the week, I’m usually already falling behind. Regardless of how well we do at sticking to our goals, it’s important to make them and to keep trying to do better all throughout the year. Because, really, isn’t that the whole point? Here are some of our goals and resolutions for the New Year! We received samples for consideration. All opinions are our own. 1. Keep a Clean Home – Try as I might, with 5 kids underfoot my home struggles daily with clutter and crumbs. One area I often neglect is the dust. Zabada has a line of high quality cleaning products, like their dust glove, that will help me easily meet my goal. The dust glove grabs both heavy and micro dust and hair collecting it as you swipe. It works great for dusting my blinds and fan blades. For my other dusty areas, the dust marvel can tackle liking cleaning my screen monitors and picture frames. Scrubbing the stove top is less of a challenge, too, with a kitchen handy. I’m loving these products that are helping me tackle my most dreaded cleaning jobs without chemicals! 2. Get the Toys Organized – My playroom can turn from organized to a whirlwind mess in just minutes. Can you relate? Make clean-up time more fun with a sturdy and unique toy box! Maxtrix Kids has introduced a new toy box that opens by lifting up the top like a traditional toy box or pulling down the side letting you stack toy boxes and bring even more storage into the same space. It’s made with heavy, quality wood so I’m certain it will last through toys of play and storage time. Connect with Maxtrix Kids on Facebook or on Twitter @MaxtrixKids for their latest updates. 3. Protect My Gear – One of the things I worry about regularly is my computer being destroyed by my kids. As a work at home mom, my laptop is always out and around while I go from lunch making role to taxi to working and back again. I’ve had wet sand thrown at my keyboard before (a few of my keys are extra sticky and have to be pressed hard) so I know the potential dangers. I can worry less this year with a simple fix: a Kid Lid that slips over my laptop screen and protects the keys so my toddlers don’t start typing away or messing with my keyboard while I’m running between all my daily duties. 4. Stay Focused – Keeping focused and on task is something I struggle with (hello Facebook and Pinterest distractions!). One of my goals is to stay on track and set time limits for things like social media and blogging to help me stay better on task while I’m working and enjoy more time with my boys when I’ve finished my work. 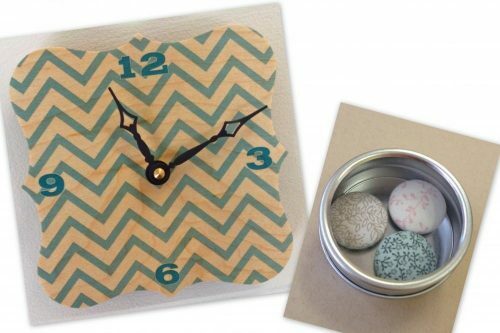 To keep me focused, I’m getting organized with a cute mini clock that will spruce up my space and remind me of the time. I can keep important reminders front and center with their darling fabric covered button magnets to tack up my notes. Both of these darling products are from Idea Chic etsy shop. They also carry other gifts, stationary, greeting cards and more. 5. Protect My Skin – We get sunny days every day of the year (even on our rainy days, it seems) here in Arizona. But even in areas that don’t see direct sunlight, sunscreen is really important. This year, I’m making a goal to be better about wearing sunscreen every day to protect my face and arms that are usually in direct sunlight. 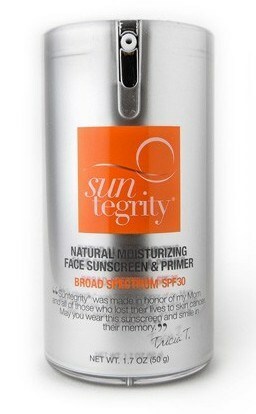 Suntegrity makes a natural facial sunscreen and moisturizer in one. Best of all, their original formula smells absolutely amazing with an inviting citrus scent. Plus, it has a full 30 SPF! They offer their moisturizer in a tinted version as well, so you can skip one more morning step by combining moisturizer, sunscreen, and foundation all into a single step! 6. Prepare for Emergencies – We are big into emergency preparedness like keeping flashlights with fresh batteries and water bottles in the car. You just never know what will happen. This year, we’re hoping to add to our food storage and emergency supplies. One neat tool we were excited to add is The Scrubba, a small foldable washing bag! You toss in a few clothes into the washing bag and scrub away with the internal washboard to clean easily wherever you may need to from camping to traveling or anywhere else. It uses no electricity and minimal water. 7. Spend More Time Outdoors – We really enjoy getting outdoors, it’s a great way to spend time together without the distractions of TV’s, video games, computers and other devices clamoring for our attention. We want to spend more time this year playing at the park, having family picnics, camping, hiking, and just being outdoors. With a little one along with us, the Ciao! Baby Anywhere High Chair will be a huge help! 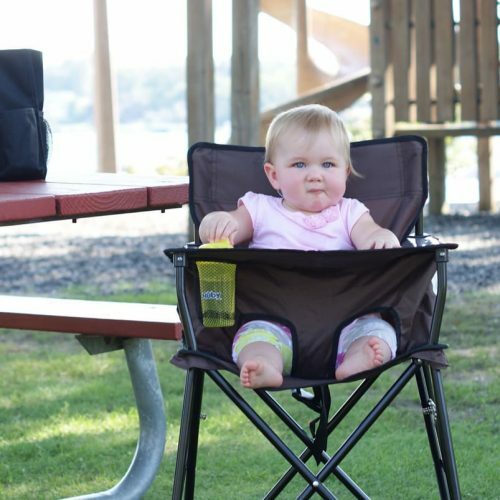 It combines a traditional kids folding camping chair with an infant seat design so your tot can sit up with you wherever you go and be supported. 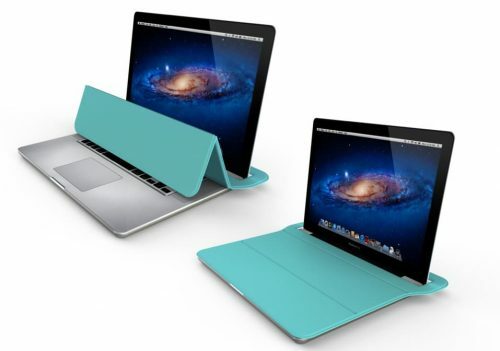 It’s perfect for dishing out their snacks or meals in, too, while you’re out and about. The compact fold makes it easy to keep in the car and take along with you on your adventures. 8. Get in Shape – One of my goals for the new year is to start tracking my movement and sleep schedules with a fitness tracker so that I can more easily set goals and motivate change. 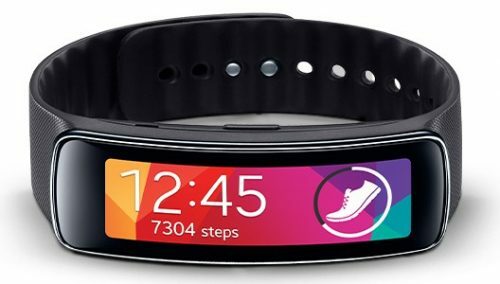 Samsung’s Gear Fit is just the ticket. It connects via Bluetooth to my phone to show me email and text notifications and also tracks my steps and sleep patterns. It even has a built in heart rate sensor! I love how comfortable it is to wear and it clips on easily with an easy clasp. The Gear Fit can last up to 3 days on a single charge, giving you the flexibility to keep going. It has a super easy interface to use and can be customized with different backgrounds and wrist bands. 9. Stay On Top Of Things – Man, it is so hard to keep everything in my life straight. This year I am determined to get my family and myself into predictable, productive routines and I am doing it with the help of Clean Mama. 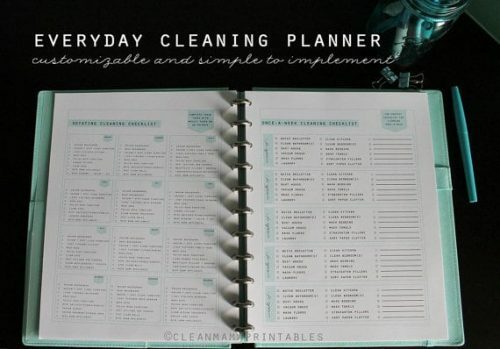 Clean Mama has a full line of affordable instant download printables that help me stay on top of my cleaning schedule, my budget, resolutions and my health goals. Without these handy lists, I would be lost! I love that I can print out as many as I need. Her rotating cleaning checklist is just genius and keeps me on top of all those tasks I hate, like cleaning baseboards, washing windows, etc. Not to mention the day to day tasks like laundry and bathrooms. You can find her resolution based packs and much, much more here. 10. Learn Something New – One of my goals is to learn how to use my DSLR inside and out. Everyone has something they want to be better at, Lynda.com can help you! Wether you are looking to improve a skill like photography, become a better public speaker, or even learn web design, you can find a class to do it here. Lynda.com has thousands of online based courses and video tutorials right at your fingertips just waiting for you explore. Do you feel like you are constantly one step behind everyone else? 2015 is your year to close that gap. Use Lynda.com to stay ahead of the curve! There is no better time than today to get started on learning something new. I want that dusting mitt! I never thought I’d get excited about a dusting mitt! LOL Setting a cleaning schedule is on my list too. Mine are not so different from yours – my #1 priority is to GET ORGANIZED. Why do I find this so difficult? Even with lists (of lists!) I’m scattered all over the place! Help! I need to get more organized. I try to write goals etc but it never fails…..I don’t do them. Protecting your gear and skin are good ones! I am looking to be better blogger I just purchased a great one on Amazon so my blogging will be more organized! I can relate to each and every one of these. Particularly the staying focused. That’s something I’m working on improving. That Gear Fit is pretty cool looking. I have a 1st Gen Jawbone UP band. It’s rather thick and gets in the way so I don’t wear it like I should. I’m looking for one that’s flat. These are fantastic tips! I love the one about staying focused. It is easy to lose sight of goals when bumps in the road occur. Love that toy box and baby chair. Awesome stuff. Those are all great suggestions! I need to get more active, get outdoors more and I really want to start and emergency bag. Get all the necessities together for ‘just in case’. Always good to have! Spending more time outdoors is also one of my goals for this year. I also plan on getting in shape, so I’m hoping the two of these go well together. Learn something new is a good one. I’d like to learn how to sew finally! My new year’s resolution is to make more time for family. I’m growing my blog, and that’s great. However, I’d like for my family to remember who I am! Thank you for sharing resolutions. I am trying to make more homemade and healthy meals. Mine our to spend more time with friends, and to budget my money so I can save more, and to travel. My new year resolution is to worry less, and stay on top of things more! With 3 kids I have slacked lately, but if I am more organized it may help the stress! My New Year resolution was to learn to say no. So far I have kept it and managed to not feel guilty!